Here is the recipe I mentioned in my Saturday post about my Great-Grandmother Bunton’s stuffing recipe. I never knew my great-grandmother. My mother didn’t know her either, and my grandmother barely knew her before she passed away on March 12, 1924, a day before my grandmother’s 11th birthday. Mom learned this recipe from grandma, who in turn learned it from her mother. Although I do have and use other stuffing recipes, this one is tradition and always part of Thanksgiving dinner. Giblets-boil gizzard in water and use broth, and throw in the turkey neck if you aren’t going to use it later. Or, if you don’t want to use turkey broth, use a can of chicken broth. You will need a grinder for this recipe, and a very large mixing bowl. Grind vegetables, grinding the onion last and immediately following, grind the slice of bread through the grinder. You can put it in the stuffing, it won’t hurt anything. What this does is takes out the “onion-y” flavor that will be left behind if you don’t use the bread. Grind the soft giblets (not the gizzard) if you want to use them. Some people don’t like the flavor, if you do then by all means use them! Place dried bread cubes in the big mixing bowl. (I have a large Martha Stewart drabware colored bowl I love to use because it’s BIG!). Put the ground ingredients in with the dried bread and add all of the seasoning. Mix well. Melt butter and add it to the stuffing mixture. Start adding the broth, 1 cup at a time, until stuffing is moist but not soggy. 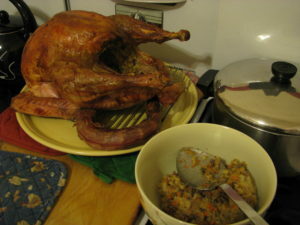 Stuff your bird and put any extra in a casserole dish and bake later at 350 degrees F. for about 30 minutes or until hot. When I put the bird in my roasting pan, I like to add what’s left of the turkey broth or chicken broth to the bottom of the pan with some water. Otherwise, your bird will dry out and you don’t want that. A merging of families-Great Grandma Bunton’s stuffing in Grandma Mayer’s Autumn Leaves Hall bowl.